Falvey Memorial Library :: Harry Potter Is Moving! The Harry Potter marathon reading time slot, that is…. To better accommodate the schedules of our frequent readers and audience members, the weekly Harry Potter reading at Falvey Memorial Library will be moving to 9 a.m. – 6 p.m. Please join us for our new, early hours! A public reading of all seven Harry potter books is taking place every Wednesday this semester from 9 a.m. to 6 p.m. Join us this coming Wednesday, 10/24, as we continue our open-mic reading of Harry Potter and the Goblet of Fire! 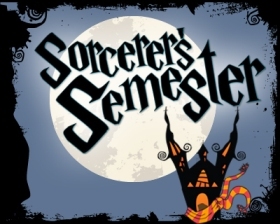 Also, please join us for the Harry Potter Costume Contest on Wednesday Oct. 31 Wednesday, Nov. 7 at 5 p.m! Library judges will award the guest with the best Harry Potter Themed Costume. The grand prize is a brand new iPod shuffle!! For more information please contact Rob LeBlanc, First Year Experience & Ethics Librarian. be writing the further wizarding adventures of ‘Harry Potter. At one point in HALF BLOOD, Hermione tells Harry she has always admired his courage.